If you’ve followed this site for some time, you might have noticed that I love comfort food and have turned numerous meat dishes into my favorite vegetarian dishes. These comfort foods are the ones I grew up on and the meals M still occasionally request. It’s always fun to try and recreate favorites from childhood. Update 4/2015: I’ve had a few comments that the lentils just aren’t cooking. This could be because of the acid from the tomatoes but it could also be old lentils. To combat the first issue, I’ve updated the instructions to cook the lentils separate then add the sauce. 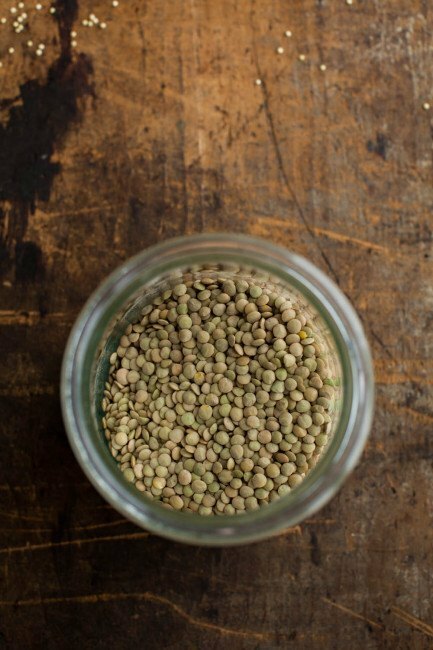 If your lentils don’t cook in 25 minutes, you most likely have old lentils and should replace! In a large skillet or pot, bring lentils and water to a boil. Cover, reduce to a simmer, and let lentils cook for 20 minutes, just until lentils are tender. You may have water leftover, that’s okay. In second skillet, heat olive oil over medium-low heat. Add minced onions, pepper, and garlic. Cook until onions and peppers are soft and fragrant, 6-8 minutes. Stir in remaining ingredients. Bring to a boil, reduce to a simmer, and simmer until lentils are tender. Stir the sauce into the lentils, cook for another 5 to 10 minutes, until sauce thickens and lentils are fully tender.Taste and adjust seasonings while cooking. Serve on a bun or toasted bread. Update: Some people are having issues with the lentils not fully cooking. I would recommend soaking the lentils overnight (like you would other legumes) before using to help soften slightly. You could also try cooking the lentils in water only until starting to get tender (20 minutes or so) then add the tomatoes, ketchup, Worcestershire, vinegar, and molasses. Sloopy Joes are one of my favorite comfort foods. I am reducing the amount of meat that I consume, therefore I think this would be a fantastic substitute. I will try it this weekend. 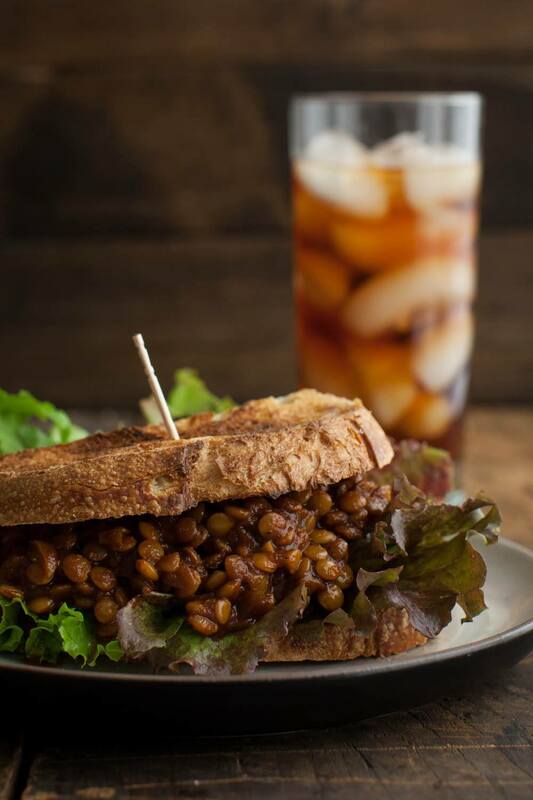 I love the idea of a sloppy joe with lentils! These look so yummy! I loved the sweet and tang of sloppy joes as a kid too. 🙂 And your recipe looks like it captures those flavors perfectly. I will be giving this a try for sure! Love the look of this as I’m obsessed with lentils haha! These sloppy joes look so good! I bet they would be excellent with some homemade pickles on the side. Ooh, these look good. Sloppy Joes are one of those rare meat dishes that my family (especially my husband) misses, so these will be well-loved at our house. I love lentil sloppy joes! I’ve even been able to get my meat-eating parents hooked (they beg me to make them every time I visit). I’ve cooked the lentils in veg stock for extra flavor, but never thought to cook them right in the sauce. I’ll have to give it a try! Hi Erin, these looked so scrumptious (and easy!) that I had to give them a try tonight. This is a winner! My boys loved them and so did my omnivorous guests who stopped in unannounced. I served mine over potatoes and with a side of steamed broccoli rabe. I doubled the recipe since I figured it would make awesome leftovers. I added a bit more onion and Worcestershire–totally amazing! Thanks for the great recipe! I love spicy lentils but have never made them into a sloppy joe! This is suchhhhh a genius idea!!!!! What a clever idea! I rarely use lentils, I have no idea why, I just never think of it! I need to try this! I haven’t had a sloppy joe in a LONG time! This is definitely more healthy than the usual recipe! 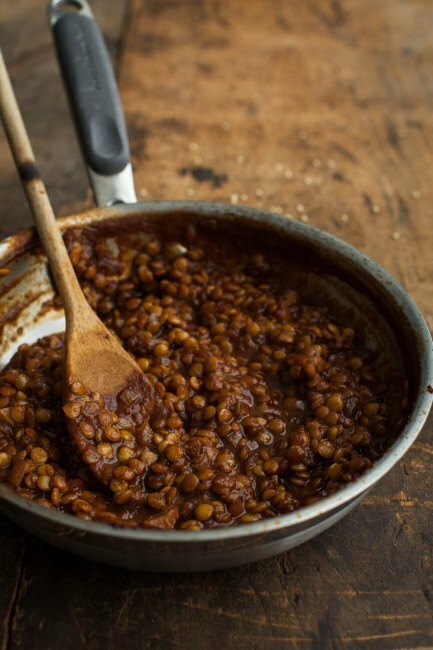 I have never cooked with lentils before, and I really want to try them. This might be a really obvious question, but do you have to soak them first like you do other kinds of beans? Nope! That’s one of the great things about lentils- quick cooking and no soaking required! I was wondering, cam this recipe be altered yo be cooked in a crock por? I love sloppy joes and I have lots of lentils, so my hubby and I are going to try this tonight. Only change I plan to make is to take out the hot spicy spices. I’m not a fan of spicy hot. Still I think this will be great! I also sent the recipe to my mom and my mother-in-law. My father and my FIL are both not doing so great. I think both moms could make this for them and I bet they will like it, before they know it is meatless. In their case, I suggested that the moms add a little beef bouillon to it. Both need to eat healthier and both are not ready to give up meat (or alcohol, or Pepsi, or potato chips, etc.) so I think something like this would be great for them! Thanks for the recipe! I had a problem with the lentils cooking through too–perhaps the salt blocked the water from softening the lentil interior. I will try again next week, cooking the lentil separately first. I know it wasn’t a problem for Ella or other readers, but perhaps your water is harder or softer than our lovely Lake Champlain source? The sauce was amazingly delicious, I am definitely going to try this again. But semi hard lentils (after more than an hour cooking) seemed likely to cause tummy aches. I’ll report back next week if the lentils cooked in plain water. If they do, I’ll add the sauce made separately and make Sloppy Joes! If my lentils won’t soften in plain water, then the lentils dried out since I bought them in April. (We’ve been eating red lentil dal all summer, which pushed the green lentils to the back of the cupboard.) If the lentils cook and soften properly in the plain water, then maybe this delicious recipe can’t be one-step in all parts of the country. Okay, maybe it must have been that my lentils were too long dried. Cook’s Illustrated did a study with lentils and concluded that salt has no effect on cooking time or bean texture. Furthermore, they suggest that for maximum flavor it’s actually essential to salt your beans at the beginning rather than the end of of cooking. Also, when soaking beans Cook’s Illustrated says that by using salt water the bean will cook up with softer and more pliable skins. Apparently the salt displaces some of the minerals like calcium and magnesium in the bean skins, which tends to make the skins tough. Since salt ions are weaker than mineral irons, they allow more water to penetrate into the skins, leading to a softer texture. Apparently during soaking the salt doesn’t make it all the way to the center of the beans, so the largest effect is on the outer skin. Cook’s Illustrated recommends 3 Tbs. of salt per gallon of soaking water. These look delicious! I am going to try them for dinner tonight. Thank you! Cooking these now and my lentils are stil hard after an hour too. Sauce tastes great so I will try partially cooking them beforehand next time. Hi Pat- I just ended up making these for dinner again and adjust the instructions to cook the lentils separate. There’s a couple reason why they might not be cooking, but this way it takes the guess work out of it! Now if the lentils don’t cook (in water alone), they are most likely old! I just made a double batch…delicious! I didn’t have any molasses. So used agave nectar, and a reduced amount, like half. I also threw in some TVP for additional texture. I’m absolutely keeping the recipe…it really was good! I made this last night. It was SO good!!!! I’m always nervous about vegetarian recreations of meat dishes, but I will definitely be making this again! And sharing it with my friends! Thank you so much for this recipe! 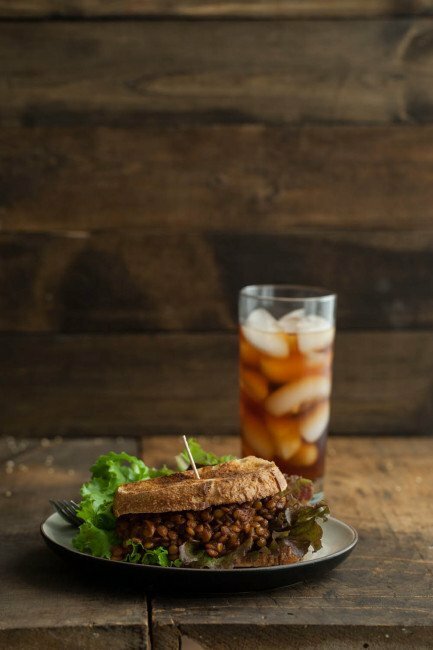 Naturally Ella’s Lentil Sloppy Joes are now a family favorite in regular rotation! Following the new directions, I cook the lentils separately in water only first, and then add the delicious sauce. I always multiply the recipe by four when I make these Lentil Sloppys! I made these last night. They are sooo good. Brought back memories of my favorite dish as a child. Even my carnivorous husband had seconds. I rated the recipe as 3 stars…it should read 5 stars. Thanks for coming back and letting me know- I’ll look into why it’s being funky!